For registered nurse and Ph.D. student Yvette Rodriguez, whether you’re looking at interactions between microbiomes or the connection between educational attainment and health literacy, in Seattle or in the Amazon, what matters most is the power of collaboration and its potential for impact. 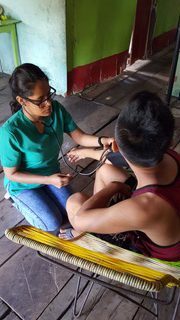 She experienced this firsthand during a research-based study-abroad project that came about with encouragement from Dr. Sarah Gimbel, co-director of the Center for Global Health Nursing, and Jose “Coco” Alarcon, of InterACTION labs. 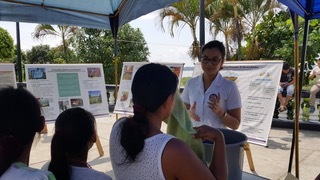 Both are project advisers in a diverse team of UW researchers in Claverito, an indigenous village of nearly 300 people perched on the edge of Iquitos, the capital of the Peruvian Amazon. The team focuses on improving the health and living conditions among approximately 50 homes that float half the year due to lack of space in the capital. Makeshift dwellings, contaminated water, and a lack of services give rise to acute and chronic health issues. The interdisciplinary group–including landscape architects, an environmental engineer, microbiome experts, dentists, nurses, and physicians–supports and studies community-generated solutions like building stairs, floating gardens, and testing plants with the potential to remove E. coli from the surrounding water by taking it up into their roots. The work has implications for some 50 to 60,000 people in similar circumstances in the area. During the summer of 2017, Rodriguez, along with bachelor student Austin Bidman, formed a complementary team with both research and clinical backgrounds to look at what had become a major issue in the Claverito community: trash. It took a week to assess a small sample area and categorize the 4000 pieces of garbage they found, nearly all plastics. From there, they looked at the potential for the trash to lead to other health concerns like vector-borne diseases from containers harboring mosquito larva or animal attractants that could lead to zoonotic diseases. Upon returning, Bidman felt compelled to start a sustainability Instagram account. For Rodriguez too, the short-term project underscored how interrelated we are. She returned to Peru about six months later in February 2018 and again in the summer of 2018 to continue working with the Claverito community and the UW team. As much as the larger team is interdisciplinary, the nurses working on the project form a cohesive and strong intra-disciplinary group. 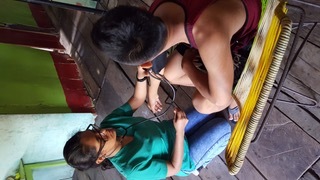 In the summer of 2018, Ph.D. student Rodriguez worked with three Doctorate of Nursing Practicum students, Marissa Masihdas, Morgan Busse, and Jane Kim, from the more clinical Family Nurse Practitioner track and all of them benefited from the partnership with the Peruvian National Institutes of Health in Iquitos and the Universidad Nacional de la Amazonia Peruana (UNAP). In addition, the UW team collaborated with seven local nursing students and two registered local nurses to build relationships with the community. Instead of outsiders coming in and telling the community what they needed, a collaborative team including community leaders, community members, and local Peruvian nurses worked together to understand and support community needs through surveys and data collection. On a more granular level, the UW team in Claverito is studying the interactions of microbiomes within individuals, families and the environment. Rodriguez is excited to be continuing to work as a researcher on the project. As a T-32 Omics and Symptom Science trainee, Rodriguez is eager to apply her knowledge. “There are not a lot of nurse scientists that have a background that would allow them to be a part of more traditional bench work, microbial data, different bio markers and things like that,” says Rodriguez, whose dissertation is focused on the relationship between gut health and disease. Even more important may be the fact that Rodriguez and other nurses bring a holistic and reciprocal big picture mindset to both the microscopic data and the real-world, human-centered interactions. In the case of the nursing team in Claverito, that mindset has led to a formal relationship with UNAP and the University of Washington School of Nursing including a study abroad for nurses there to come here and exchange knowledge and practices.